Monte Carlo simulation is useful for including variability in developing a model of a system. This simulation lets you see the impact of variability on the yearly percentage return for a retirement investment. Rather than using a fixed percentage return, this Demonstration uses a random sample from a triangular distribution to model the average return for each year. The triangular distribution is used since its parameter values (minimum, model, and maximum) allow one to account for the wide range of variability that can occur from year to year. 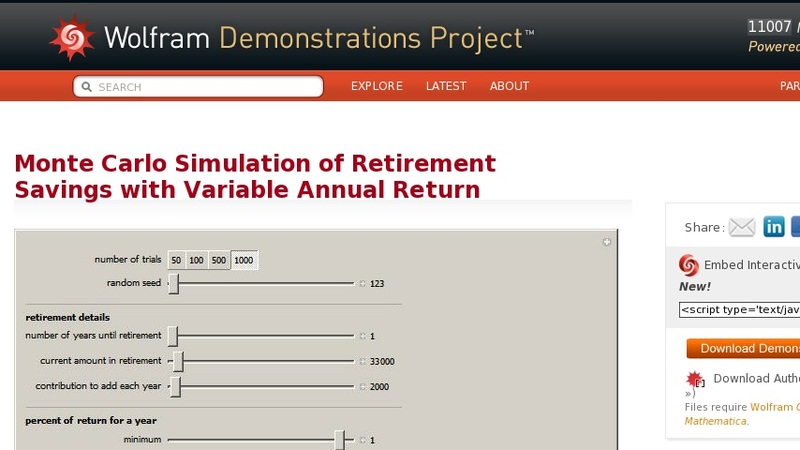 This Demonstration lets you specify the number of simulation trials to run, a random number stream for the simulation, the number of years until retirement, the initial amount in savings, and the fixed contribution amount to add each year. You can also define the minimum, most likely, and maximum return in a year. The results show the histogram of the total retirement amount for the number of trials. The results also indicate the lowest, ... percentile, median, average, ... percentile, and maximum retirement amount generated for the range of simulation trials. The red dot on the histogram indicates the average amount.